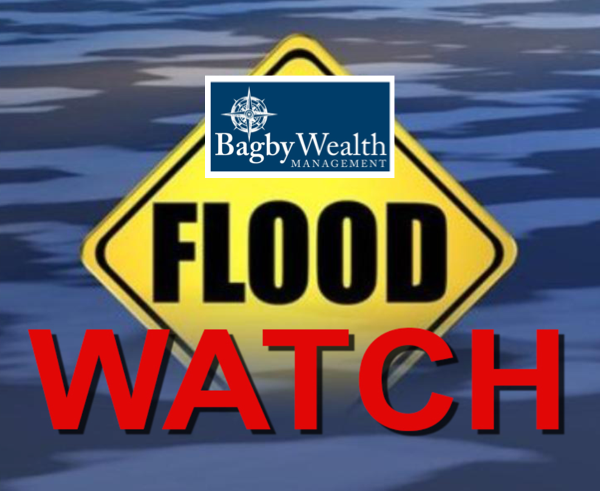 Stoddard County, Missouri - The National Weather Service in Paducah, Kentucky has issued a Flood Watch from 7 a.m. Thursday until 7 a.m. Friday for Stoddard County, Missouri. * A COUPLE ROUNDS OF SHOWERS AND SCATTERED THUNDERSTORMS WILL IMPACT THE HEARTLAND THROUGH TONIGHT. RAINFALL TOTALS OF 2 TO 3 INCHES SHOULD BE WIDESPREAD ACROSS MUCH OF THE AREA. LOCALLY HIGHER AMOUNTS UP TO 4 INCHES ARE POSSIBLE. ... A FLOOD WATCH MEANS THERE IS A POTENTIAL FOR FLOODING BASED ON CURRENT FORECASTS. YOU SHOULD MONITOR LATER FORECASTS AND BE ALERT FOR POSSIBLE FLOOD WARNINGS. THOSE LIVING IN AREAS PRONE TO FLOODING SHOULD BE PREPARED TO TAKE ACTION SHOULD FLOODING DEVELOP. Weather sponsored by Bagby Wealth Management. 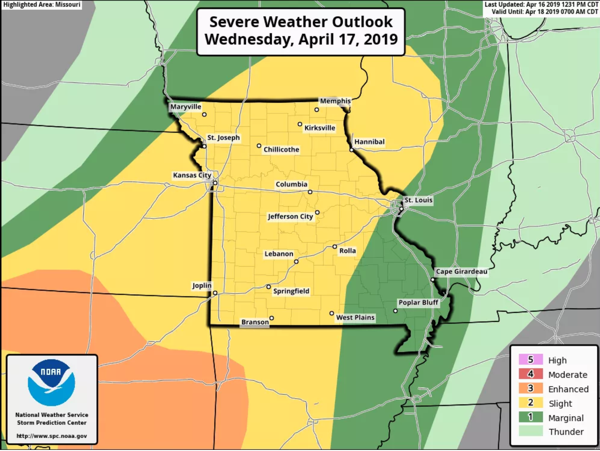 Stoddard County, Missouri - Strong to potentially severe thunderstorms looking to make a return for much of Missouri Wednesday evening into the overnight hours. A storm system will make its way across the state. Along with this storm system comes a cold front will be the focal point of the thunderstorm development for the state of Missouri tomorrow night. Ahead of this cold front, the environment will become increasingly favorable for strong to severe storms. These storms are expected to develop before sunset across western and northwestern Missouri and spread east southeastward through the night. Given the environment, large hail and damaging winds especially will be the primary hazards with the more intense thunderstorms. Right now, the tornado threat is very low but we will monitor if the threat does indeed increase. 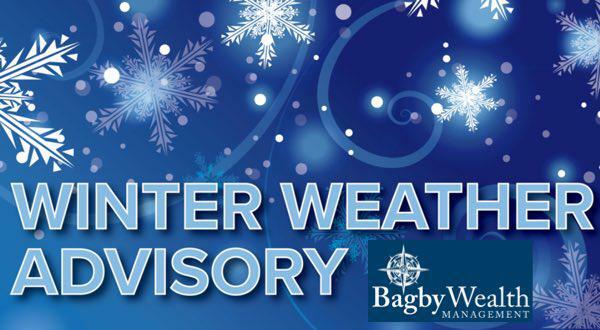 Weather provided by Bagby Wealth Management. Stoddard County, Missouri - The National Weather Service in Paducah, Kentucky has issued a FREEZE WARNING for Stoddard County, Missouri. ... THE NATIONAL WEATHER SERVICE IN PADUCAH HAS ISSUED A FREEZE WARNING, WHICH IS IN EFFECT FROM 10 PM THIS EVENING TO 9 AM CDT MONDAY FOR ALL OF WEST KENTUCKY, AND MOST OF SOUTHWEST INDIANA, SOUTHERN ILLINOIS, AND SOUTHEAST MISSOURI. THE FREEZE WATCH IS NO LONGER IN EFFECT. * TEMPERATURE...EXPECTED TO BEGIN TO DROP BELOW FREEZING LATE SUNDAY EVENING, AND FALL INTO THE UPPER 20S FOR LOWS. TEMPERATURES WILL SPEND SEVERAL HOURS BELOW FREEZING. * IMPACTS...DEVELOPING FRUIT TREE BLOOMS, EARLY SEASON ROW CROPS, AND ANY TENDER, YOUNG VEGETATION MAY BE DAMAGED DUE TO THE EXTENDED PERIOD OF SUB-FREEZING TEMPERATURES. 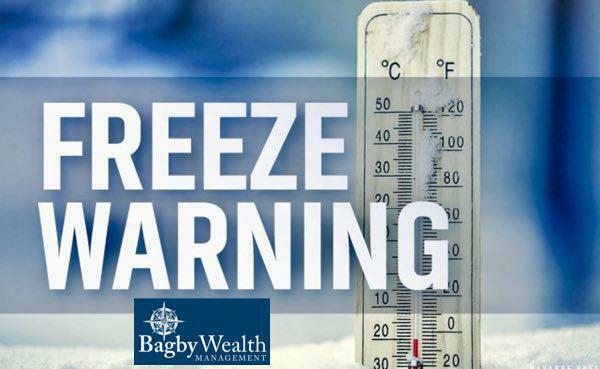 ... A FREEZE WARNING MEANS SUB-FREEZING TEMPERATURES ARE IMMINENT OR HIGHLY LIKELY. THESE CONDITIONS WILL KILL CROPS AND OTHER SENSITIVE VEGETATION. 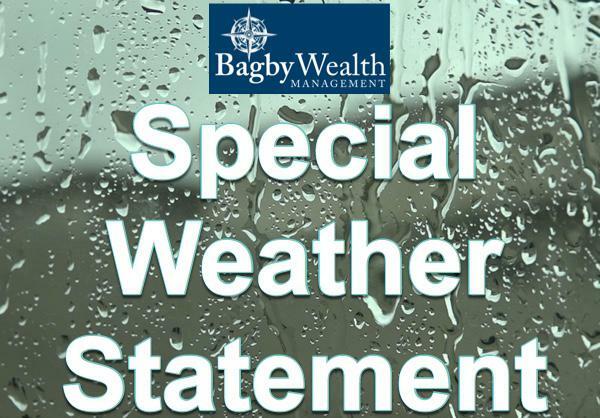 Special Weather Statement Issued for Saturday, March 9th until 2 p.m.
Stoddard County, Missouri - A SPECIAL WEATHER Statement has been issued by the National Weather Service in Paducah, Kentucky for Stoddard County, Missouri. WE WILL BE MONITORING FOR AN INCREASE IN THUNDERSTORM ACTIVITY. SOME STORMS MAY BECOME SEVERE ACROSS SOUTHEAST MISSOURI, WEST KENTUCKY AND FAR SOUTHERN ILLINOIS. STRONG AND GUSTY WINDS ARE ALREADY ONGOING, EVEN OUTSIDE OF THUNDERSTORMS. SOUTH WINDS ARE AVERAGING 15 TO 25 MPH WITH GUSTS TO 35 MPH. HIGHER GUSTS HAVE BEEN OBSERVED WITH SHOWERS AND STORMS. CONTINUE TO MONITOR THIS DEVELOPING WEATHER SITUATION. MONITOR FOR POSSIBLE WATCHES AND WARNINGS. * TIMING... WINDS WILL BEGIN TO INCREASE AROUND MIDDAY, WITH PEAK WIND SPEEDS AND GUSTS OCCURRING DURING THE MID TO LATE AFTERNOON. * WINDS... SUSTAINED WINDS 20 TO 30 MPH, WITH GUSTS UP TO 45 MPH, ARE EXPECTED. 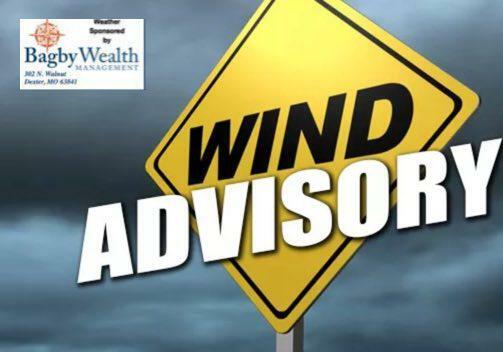 A WIND ADVISORY IS ISSUED WHEN SUSTAINED WINDS ARE EXPECTED TO REACH 30 MPH OR GREATER FOR LONGER THAN ONE HOUR...OR WIND GUSTS ARE EXPECTED TO REACH 40 MPH FOR ANY DURATION. Stoddard County, Missouri - The National Weather Service in Paducah, Kentucky has issued a Special Weather Statement for Stoddard County, Missouri. ... RAIN IS EXPECTED TO TRANSITION TO SNOW LATE TONIGHT ACROSS SOUTHEAST MISSOURI, SOUTHERN ILLINOIS AND SOUTHWEST INDIANA. THE TRANSITION WILL CONTINUE SOUTH INTO WEST KENTUCKY ON SUNDAY. SOME ACCUMULATING SNOW APPEARS LIKELY. THE BEST CHANCE OF SNOW THAT MAY CAUSE TRAVEL IMPACTS IS EXPECTED TO BE NORTH OF A POPLAR BLUFF MISSOURI TO CAIRO ILLINOIS TO OWENSBORO KENTUCKY LINE. ONLY MINOR ACCUMULATIONS OF SNOW ARE FORECAST FROM THE MISSOURI BOOTHEEL INTO WEST KENTUCKY, WITH A LOWER LIKELIHOOD OF TRAVEL IMPACTS AS SURFACE TEMPERATURES NEAR OR SLIGHTLY ABOVE FREEZING ARE FORECAST. THE PRECIPITATION WILL DIMINISH FROM WEST TO EAST SUNDAY AFTERNOON, WITH DRY AND COLDER WEATHER FOR SUNDAY NIGHT. ARCTIC AIR IS EXPECTED TO OVERSPREAD THE AREA SUNDAY NIGHT AFTER THE RAIN AND SNOW HAS LEFT THE AREA. NORTH WINDS WILL GUST 15 TO 25 MPH AT TIMES AND LEAD TO WIND CHILLS NEAR OR BELOW ZERO OVER MUCH OF THE AREA BY SUNRISE MONDAY. THE SNOW IS NOT LIKELY TO MELT MUCH THROUGH AT LEAST TUESDAY AS WE WILL REMAIN IN THE DEEP FREEZE. MOST OF THE AREA WILL CLIMB ABOVE FREEZING ON WEDNESDAY. Stoddard County, Missouri - The National Weather Service in Paducah, Kentucky has issued a Winter Weather Advisory for Stoddard County, Missouri. * WHAT...FREEZING RAIN IS EXPECTED. TOTAL ICE ACCUMULATIONS OF UP TO ONE TENTH OF AN INCH ARE POSSIBLE. * WHERE...LIGHT ICING IS EXPECTED ACROSS MUCH OF SOUTHEAST MISSOURI AND ADJACENT PORTIONS OF SOUTHERN ILLINOIS. * WHEN...FROM MIDNIGHT TONIGHT TO NOON CST THURSDAY. * ADDITIONAL DETAILS...SLICK TRAVEL CONDITIONS ARE LIKELY TO DEVELOP, ESPECIALLY ON BRIDGES AND OVERPASSES. ... A WINTER WEATHER ADVISORY MEANS THAT PERIODS OF FREEZING RAIN WILL CAUSE TRAVEL DIFFICULTIES. EXPECT SLIPPERY ROADS. SLOW DOWN AND USE CAUTION WHILE DRIVING.